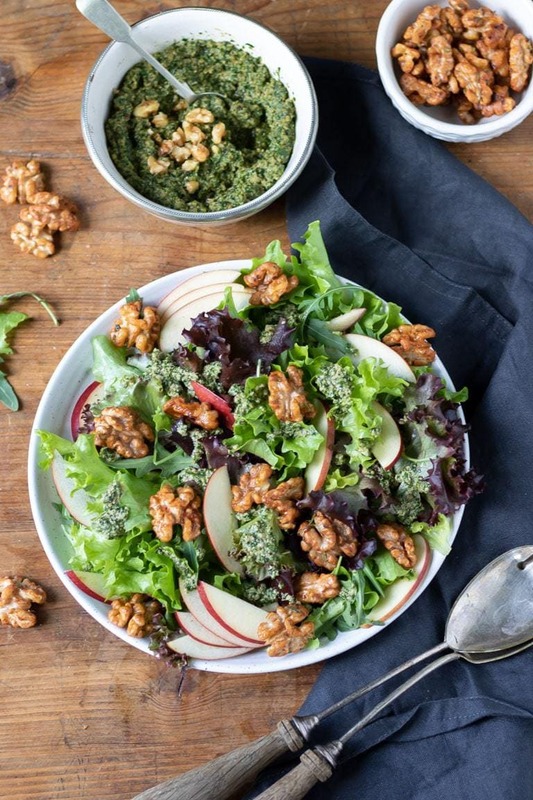 This tasty apple walnut salad is dressed with an easy and delicious walnut pesto. It’s then sprinkled with quick maple and rosemary glazed walnuts. It’s a flavour packed vegan salad that’s great on it’s own or as a side dish. 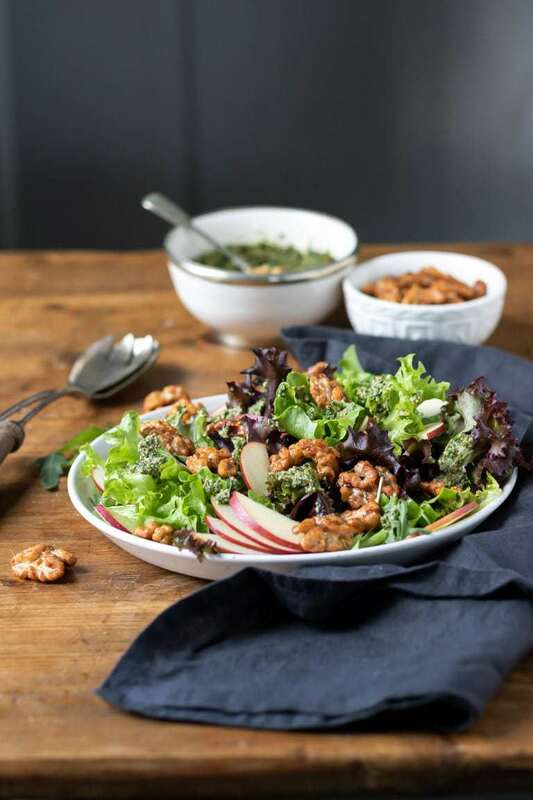 The perfect salad to make the most of California Walnuts! Commissioned recipe for California Walnuts. I love the way one simple ingredient can transform a dish. A handful of frozen berries in your oatmeal, chocolate chips in banana bread or rosemary in a stew. California Walnuts are one such ingredient with supreme transformative powers. In brownies, walnuts’ mild, sweet, creamy taste offsets the bake’s richness beautifully and brings welcome texture. It’s no wonder they’re so often paired together. 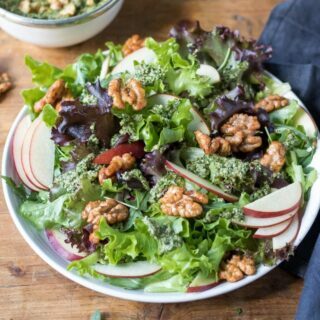 Without walnuts, a Waldorf salad would just be creamy apples and celery. 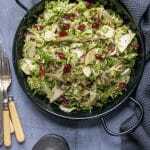 But walnuts add crunch and their unmistakable aromatic taste, elevating it to an enduring classic salad. 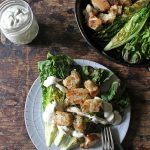 In this walnut salad, I’ve made the most of their taste and texture. 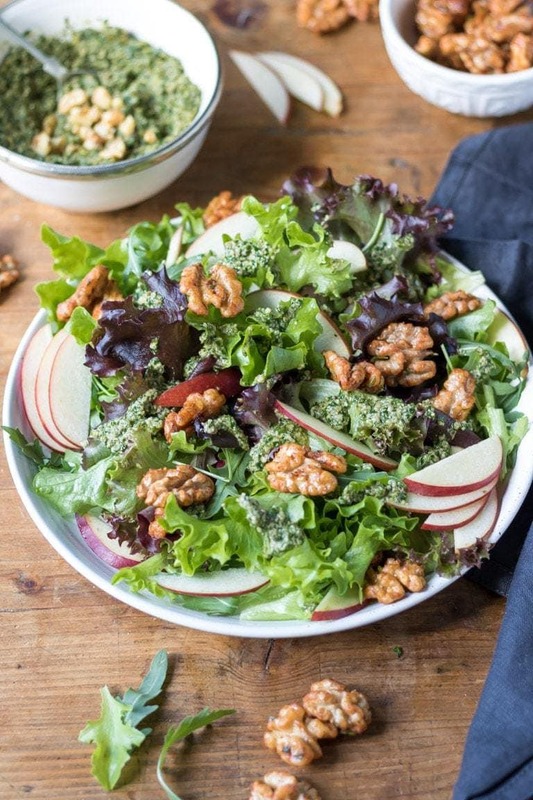 The easy walnut pesto becomes a fragrant dressing to the mixed leaves and thinly sliced apple. Then, to add a bit of pizzazz, I’ve topped the salad with maple glazed walnuts, with rosemary and smoked paprika. It’s super quick and easy to make, but adds a huge burst of flavour. 1. The walnut tree has been around since 7,000 BC and is the oldest tree food known to man. 2. California is the second largest producer of walnuts in the world, with 335,000 acres, and they’ve been cultivating them there for over 230 years. 3. A walnut sapling takes 5-7 years to grow into an adult tree ready for harvesting. 4. A walnut tree can continue to bear fruit for up to 100 years. 5. Californian-grown walnuts are called ‘English Walnuts’. Although the variety originated in Persia, they’re named after the English merchants who introduced them to in the late 1700s. 6. Two thirds of the world’s trade volume of walnuts come from California. 7. Walnuts are the only tree nut to contain significant amounts of the plant-based essential omega-3 ALA. Research has shown ALA to have a beneficial role in the prevention of heart disease and strokes. California walnuts are nutrient dense and contain omega-3s which support health in different ways. I love adding a handful of nutritious California Walnuts every day, either as a snack or added to my cooking, as they’re a simple step towards a healthier life. Plus, they have an excellent crunch and flavour! If you’re looking for other walnut recipes, try my Date and Walnut Bread, add them to my vegan carrot cake or vegan banana bread. You could also sprinkle a few on my apple pizzas or into baked oatmeal. 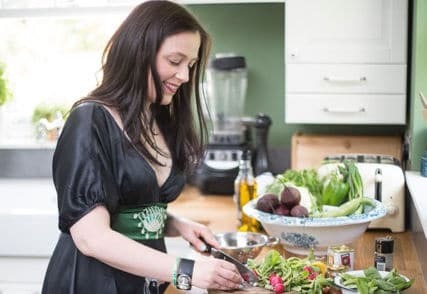 I’ve made a quick walnut pesto as the dressing for this salad. It’s vegan, but you could add a few tablespoons of parmesan if you like. 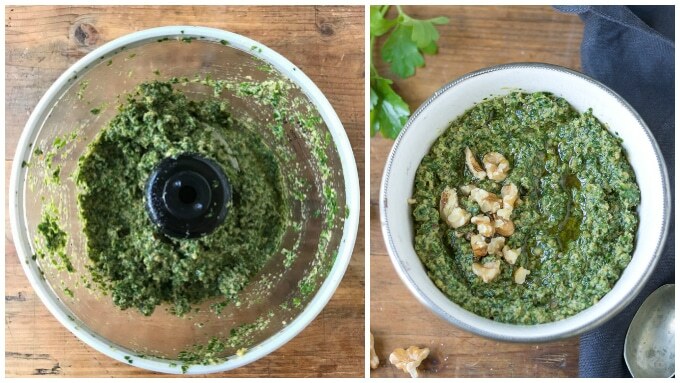 The step by step tutorial shows how easy walnut pesto is to make. Then scroll down to the recipe card for the full recipe. 1. Heat a dry pan, then add the walnuts and gently toast until golden, shaking the pan often so they don’t burn. 2. Add them to a small food processor, along with the parsley, garlic, lemon juice and salt and pepper. 3. Whiz until it forms fine crumbs. 4. Keep the motor running and slowly pour the olive oil in through the feed tube, whizzing until it’s all combined. 5. Store in an airtight container in the fridge for up to 1 week. 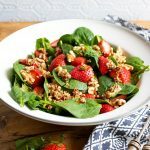 To add a little extra ‘wow’ to this salad, I like to make glazed walnuts. They sound fancy, but actually they’re really easy and only take a few minutes. Simply toasting the walnuts in a dry frying pan and adding a little brown sugar and maple syrup will create lovely glazed walnuts. However, I’ve upped the flavour stakes by also adding a little chopped rosemary and a bit of smoked paprika. If you don’t have them, then feel free to leave them out – but if you can, do try it with them! The walnuts burst with taste. 2. Add the maple syrup, brown sugar, rosemary, paprika and sea salt and heat, stirring, for a minute or two until the sugar dissolves. 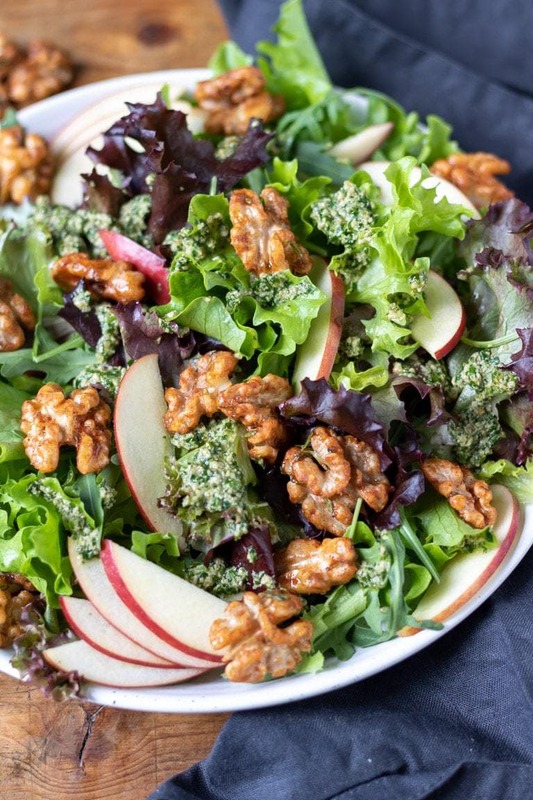 This apple walnut salad has a tasty walnut pesto dressing. It's then sprinkled with easy rosemary maple glazed walnuts. It's a delicious vegan salad recipe that's great for dinner or a side dish. 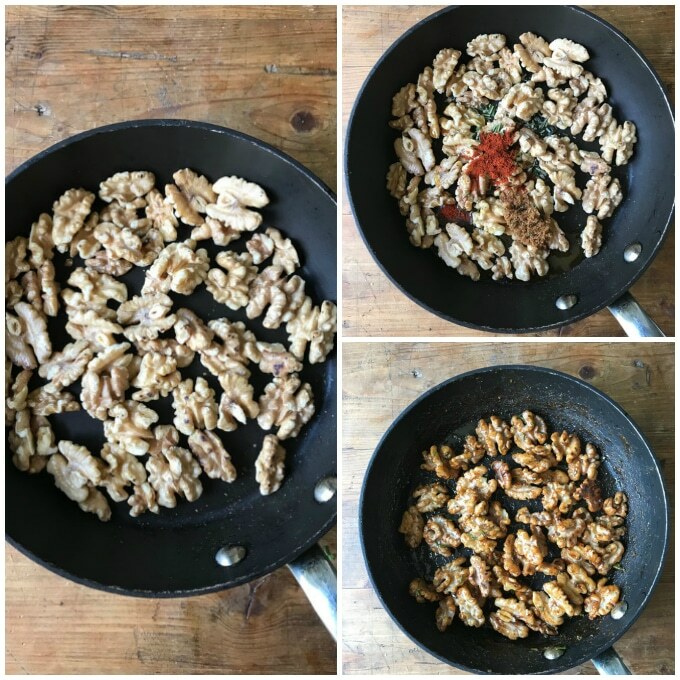 Heat a dry frying pan, then add the walnuts and lightly toast for a few minutes until they begin to darken and smell fragrant, stirring often so they don’t burn. 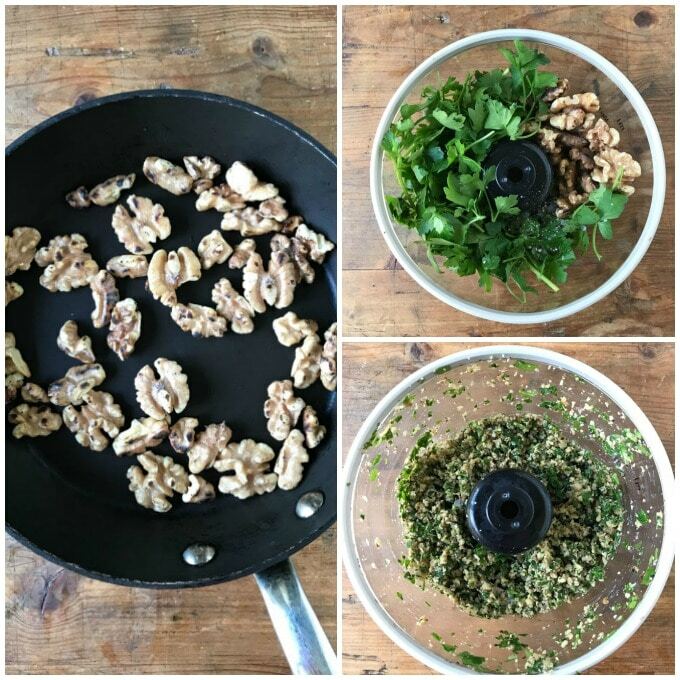 Add the toasted walnuts, parsley, garlic, lemon juice and salt and pepper to a small food processor and whiz until it forms fine crumbs. Keep the motor running and slowly pour the olive oil in through the feed tube, whizzing until it’s all combined. Store in an airtight container in the fridge for up to 1 week. Heat a dry frying pan over a medium heat. Add the walnuts and lightly toast, shaking the pan often, for a few minutes until golden and fragrant. Add the maple syrup, brown sugar, rosemary, paprika and sea salt and heat, stirring, for a minute or two until the sugar dissolves. Spread the nuts onto a plate to cool. Core and quarter the apple then slice it thinly. Add the lemon juice to a bowl of cold water and put the apple slices into it for a few minutes to prevent browning. Gently toss the salad leaves together with the drained apple in a large serving bowl. Just before serving, add a drizzle of the pesto and spoon on the glazed walnuts. Note: if necessary, loosen the pesto by stirring in a little water. Disclosure: This walnut salad recipe was sponsored by California Walnuts. All opinions are my own. Walnuts are so good for you! I definitely need to use them more, love the suggestions! This looks absolutely delicious! I have never really thought of adding nuts or anything like that to my salad before but after seeing this I am going to have to give it a try! 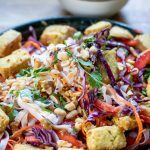 With the warmer weather on its way I will definitely be eating more salads so thanks for sharing this fab recipe! The walnut pesto sounds delicious! I’ll have to make it! I’ve been eating more salads in an effort to cut carbs. But they can easily get boring. This one looks stunning! Each ingredient compliments the other. It is simply delicious! LOVE this salad! I adore pesto so much and now I am thinking why I never thought to pair it with apple before! Thanks for this awesome recipe, Totally trying it for dinner tonight! It’s that time of year where I’m longing for a good salad. And, my nephew is vegan and I worry about making sure there’s something he will like when we have the family over to this is perfect for me. The walnut pesto totally makes the salad! Delicious!